Hello , i'm Tarun from India. 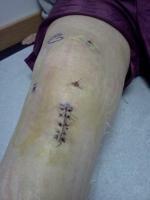 I had my acl surgery on 19th october(more than 3 months ago). I'm doing my physio and even started gym. I just have some pain when i do a light jogging but i'm pretty sure that it will get better with time. I do stationary cycling regularly too. I have my army interview coming up in about a month but my doctor strictly said NO to me because my knee is not strong enough for the physical training. But i'll be appearing for the interview again in probably october. Then it would be 1 year after my surgery. So i want to ask this , that will I be good enough to go for that then ? Also a doctor said to me that he doesn't think that I should join army because it's possible that i'll not be satisfied with my knee some years later like in 10 years because of the too much physical activities. But I have all my heart to join the army. It is what i've dreamed of. I want to know your precious opinion on this. You'd be helping me a lot if you reply to this. Please reply to this. I'll be very grateful.